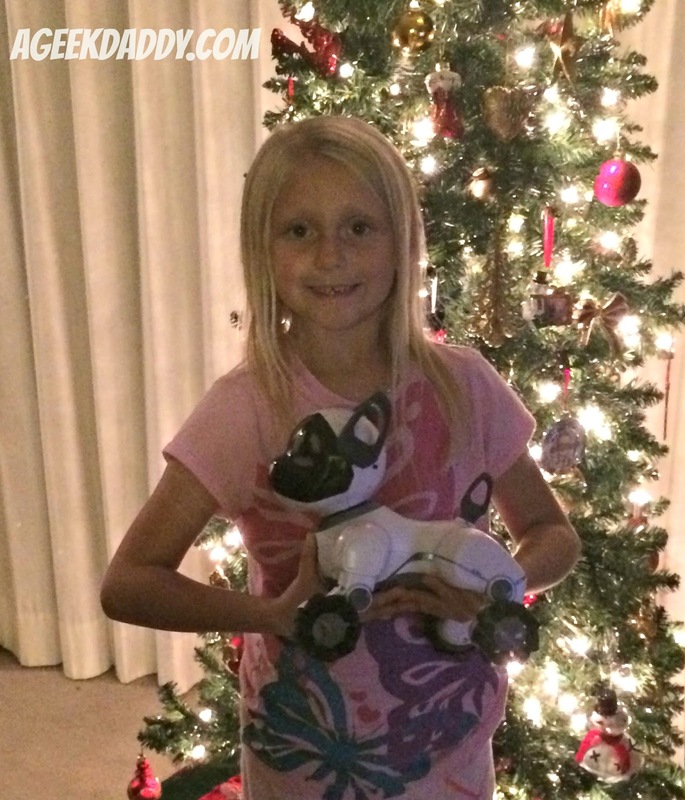 My daughter has been fascinated with the notion of getting a robot dog. When she found out that I didn't have the technical prowess to actually build one she began searching store aisles during shopping trips hoping to buy one. She was ecstatic when I actually found her one and brought it home. We have a new addition to our family now -- CHiP, the robot dog, from WowWee. 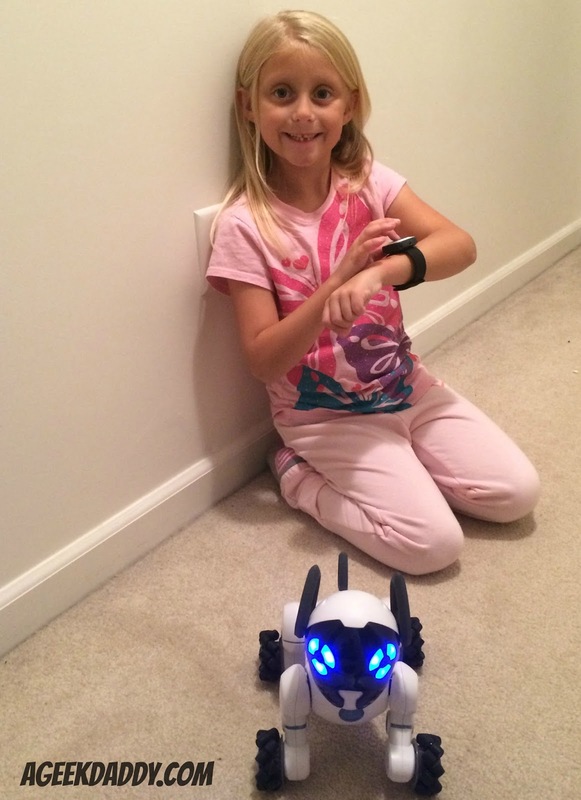 My kids have had more fun playing with CHiP than with any other toy our family has had the chance to review for ageekdaddy.com this year. They've been playing fetch with it, having CHiP chase them around the house with its leash mode, and even doing yoga with their new robot dog. You have to check out the yoga poses it can do! Because of all the enjoyment it has brought my own children, it is a toy I highly recommend you consider as a gift to put under a Christmas Tree for a child in your life this holiday season. CHiP comes with a recharger bed, smart ball, and smart band. Interacting with CHiP is what really gets children immersed into playing with it and there are lots of ways to direct the toy as it responds to controls from an app for mobile devices, voice instructions, touch, signals from the smart ball and commands from the smart band. These interactions with CHiP provide hours and hours of fun. Vocal commands will have CHiP complete some impressive dog tricks and robotic dance moves. Advanced touch sensors allow CHiP to respond to being petted or having his nose nuzzled. The more CHiP is played with the more the robot dog's behavior develops based upon engagement with its owner allowing the toy to develop unique personality traits. No two CHiP’s are ever completely alike based upon its cutting edge artificial intelligence. Wearing the smart band on your wrist allows CHiP to recognize and follow you. You can also use it to steer the robot dog around like a RC toy. Clicking a like button when CHiP performs in a manner that pleases allows the robot dog to be trained and helps shape its personality when it comes to interacting with you. The included smart ball combined with the robot dog’s infrared vision allows the toy to play fetch, soccer and other games with you. The smart charger that comes with him combined with the toy’s beaconsense capabilities allows CHiP to find this bed that has been placed by an electrical outlet on his own when he gets tired in order to get a recharge. Even a robot dog needs a nap sometime. Wow this toy can recharge itself when its batteries run low ... very impressive! Plus there are no messes from fur or poop to clean up from this robot dog. 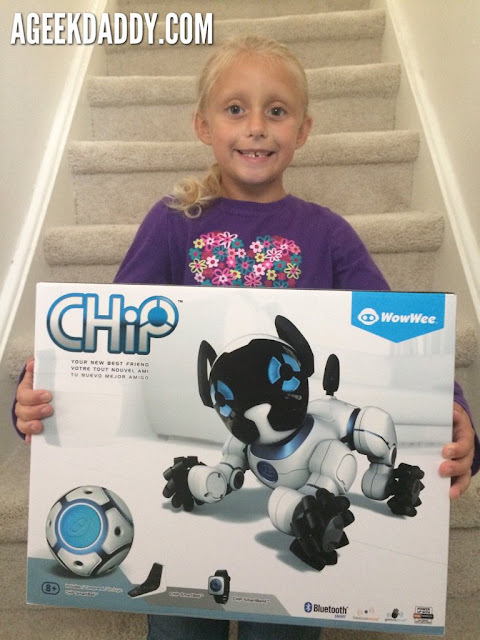 CHiP has high tech features that allow it to be smart and trainable but its AI also makes this robot dog affectionate and huggable.CHiP has quickly become one of my children's favorite toys. 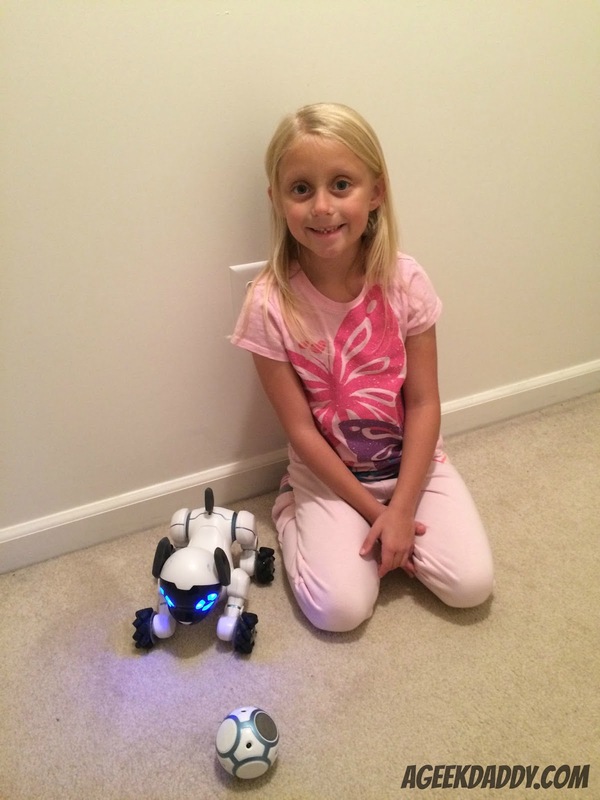 Based upon the robot dog's top notch technological attributes, variety of interactive options that promote engaging in imaginative play, and the enjoyment its abilities and behaviors bring to kids, CHiP has earned A Geek Daddy nod of approval.